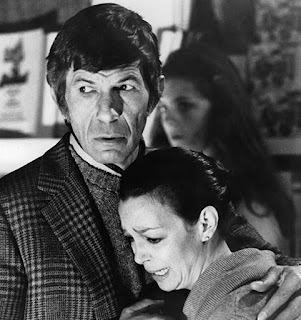 I decided to watch the 1978 version of Invasion of the Body Snatchers, starring Donald Sutherland, Brooke Adams, Jeff Goldblum, Veronica Cartwright, Leonard Nimoy, and others. The remake was directed by Philip Kaufman (writing credits include Raiders of the Lost Ark, The Right Stuff). 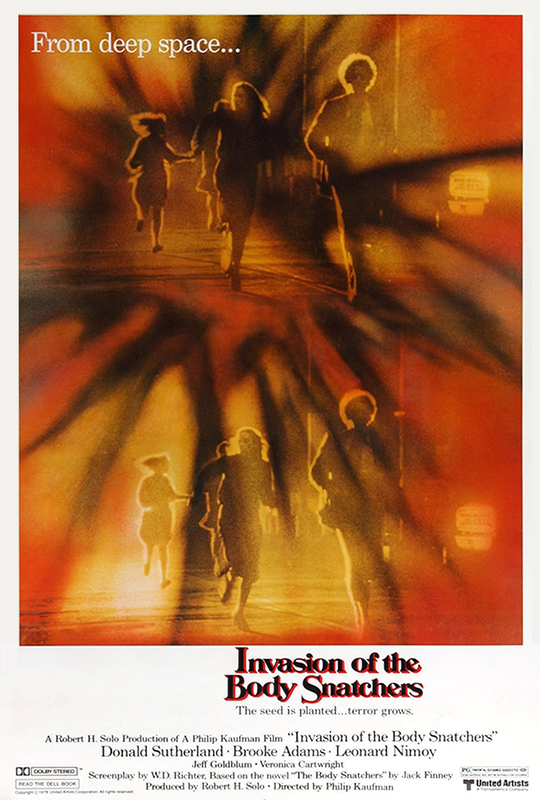 This first remake of the paranoid infiltration classic moves the story from a small town to the streets of San Fransisco and starts as one character notices that his friends are complaining about relatives acting different but when questioned later they themselves seem changed as they deny that anything is wrong. As the invaders increase in number they become more open about the invasion and our primary characters must try to escape the city or suffer the same fate. 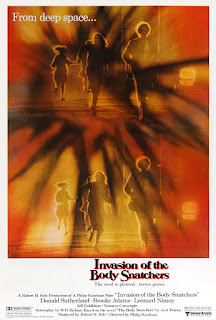 The film has a bit of a clumsy opening into the first act, getting right to the point of little alien entities hatching in outer space and making their way to Earth, where they land in San Francisco of all places, blooming as cute little flowers, which later infect our resident human population, slowly at first, but then the spread among humans grows exponentially. We watch as a few folks are starting to notice how people around them are less emotive than normal, with spouses and co-workers passing off their random observations at first, until it's too late. The film runs just a bit over two hours, and to be honest, I'm not sure if they really needed two hours, but rather than jumping quickly from plot point to plot point, director Kaufman takes his time developing various moments or settings in the film. He's taken what could have been a cheap attempt at a remake and draws it out nicely. Act one is pretty much the invasion slowly taking hold, act two it spreads and act three watches our primary cast on the run, but in the process, shows the underpinnings of the actual invasion and how it spreads. A lot of the drawn out scenes are pretty much a bunch of tension builders which works well with the alien invasion plot. But sometimes, you'd wish they just get on with it. It's weird to see Leonard Nimoy smiling and acting, well, human! Donald Sutherland brings his usual style to the scene, but he's just part of the bigger picture where Brooke Adams really sells her spin on seeing things happening around her but no one pays attention until it's too late. Overall, it's a well done remake and and is a fun way to spend a few quiet hours absorbing a classic remake. It got a 7.4/10 on IMDb. Here's our review of the 1956 version.